When a Michelin-starred chef launches a second restaurant, there’s always going to be a buzz about. 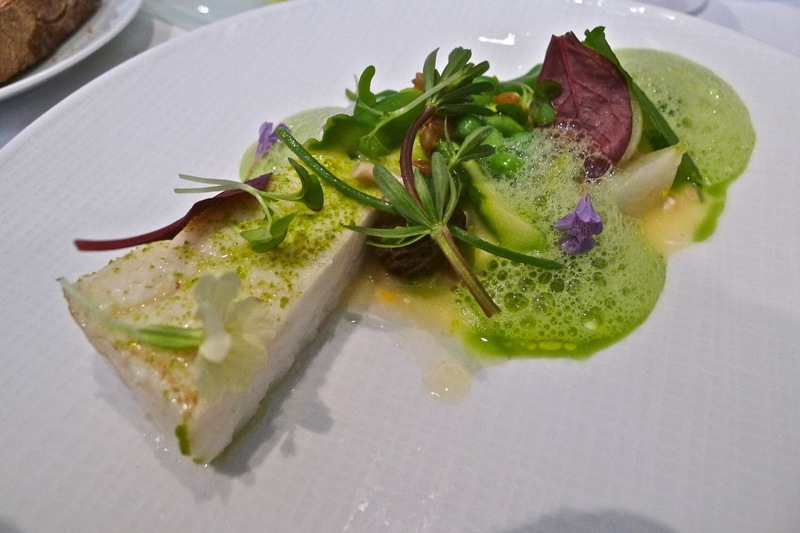 When a multi-starred chef opens a second, the jungle drums really start to beat. I imagine then, that Parisian tongues started to wag when at the start of 2012, chef Shinichi Sato and Guillaume Guedj of Passage 53 (see here) opened another eatery next door but two at No.56 - and what thoughts when they discovered it would not be another gastronomic temple of haute cuisine, but a humble gyōza bar? 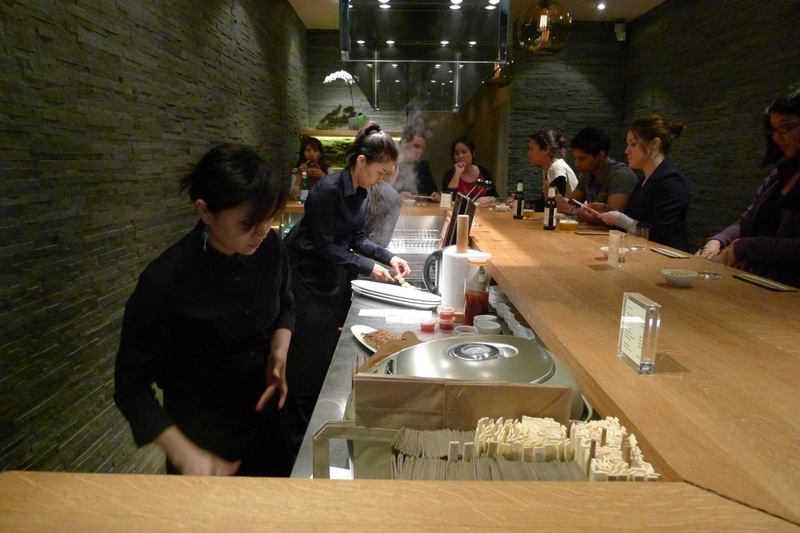 Originally hailing from Hokkaido, Sato loves gyōzas and is a well renowned master ‘gyōzier’ (my word for it). 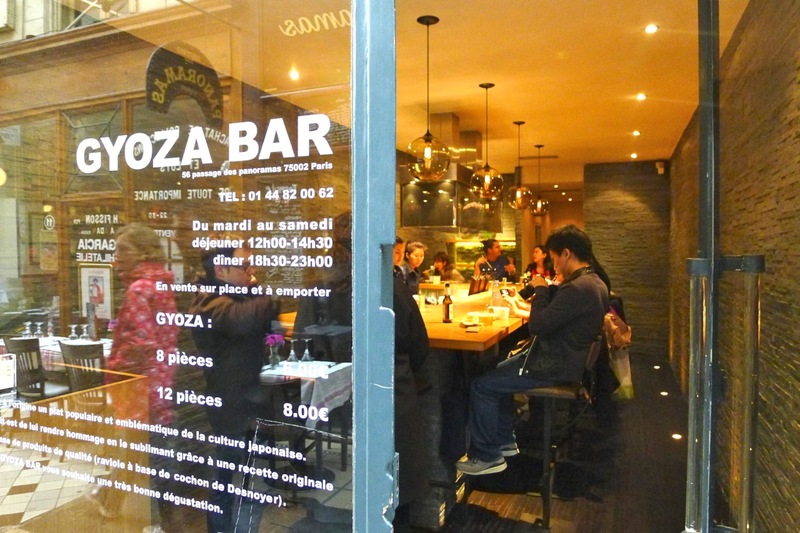 With his ambition achieved to become the first Japanese chef in France to be awarded two Michelin stars, he has realised another dream with Gyōza Bar. 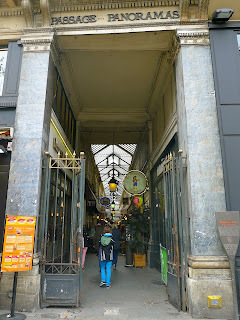 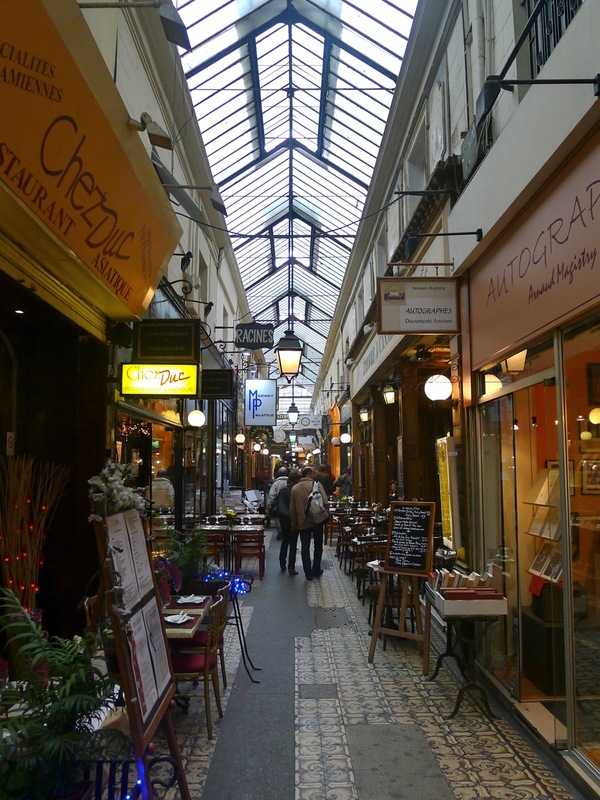 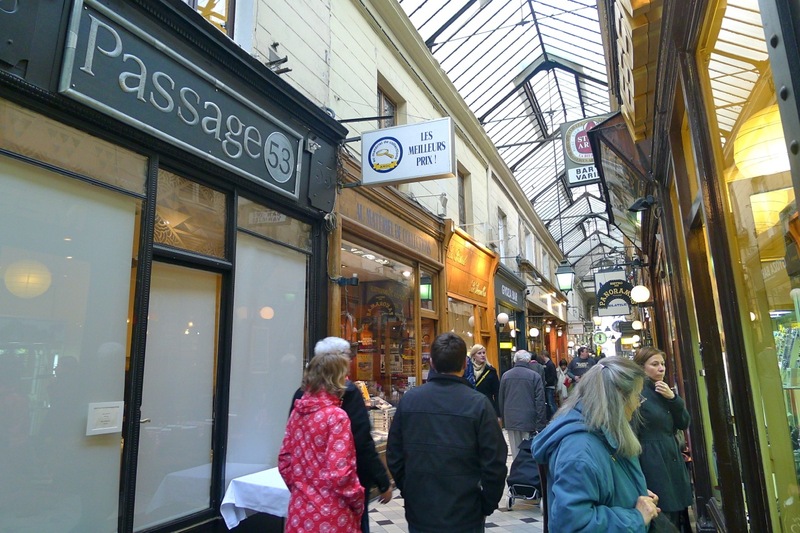 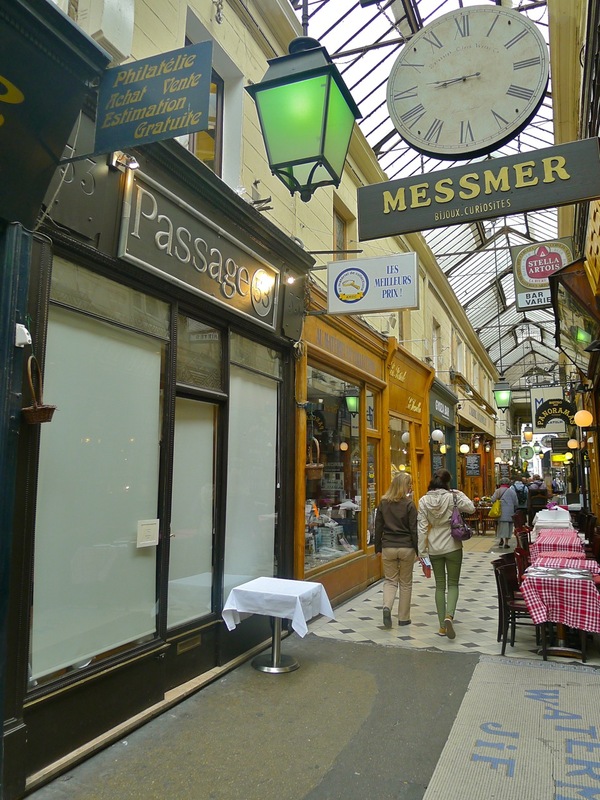 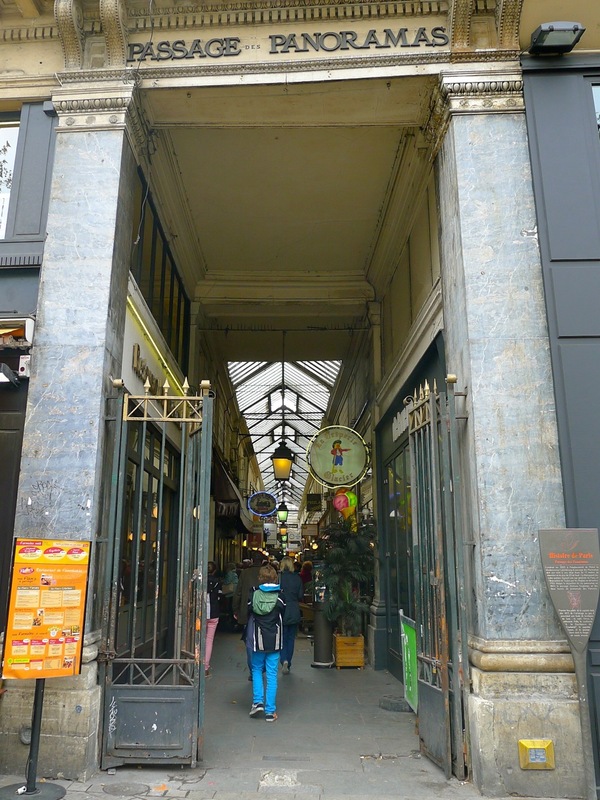 Having been built in 1799, Passage des Panoramas is well known to sightseers as ‘the oldest covered walkway in Paris’. 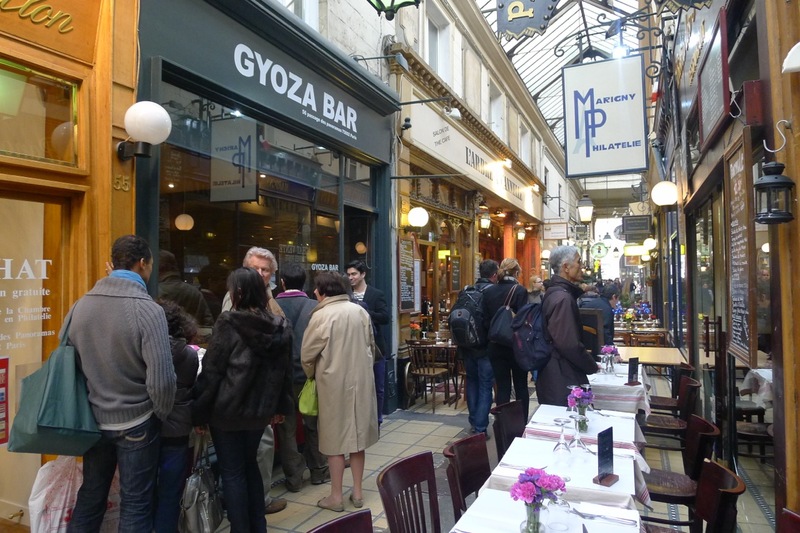 Over the centuries it has undoubtedly seen many diverse comings and goings, but in amongst what are mainly touristy bistros, Gyōza Bar adds an authentic taste of Japan, served up in décor that adds splash of industrial New York-esque chic. There are twelve counter seats where diners can choose to order either 8 gyōzas for €6 or 12 ‘pièces’ for €8 – naturally, I selected 12 – oh, and another 8 to take away (well, they were the best gyōza’s I’ve ever had!) Judging by the queue building up outside before they opened, they seemed to be getting a few other seals of approval. At Gyōza Bar there is only one variety available – filled with Hugo Desnoyer’s prime pork loin, leek, garlic and ginger. 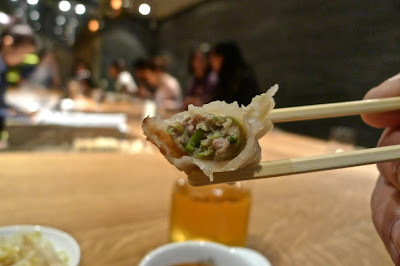 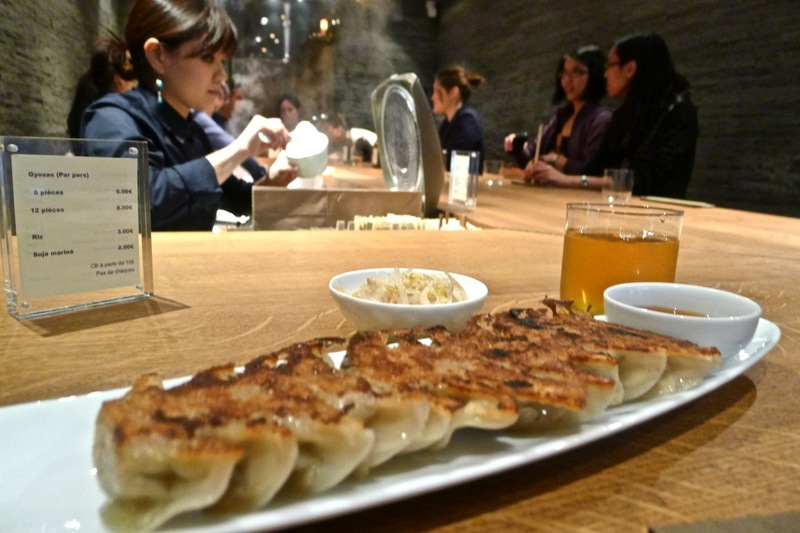 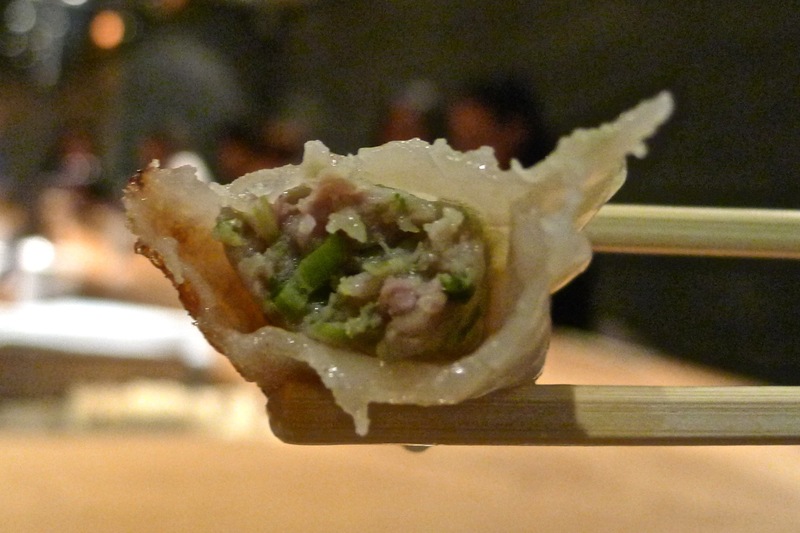 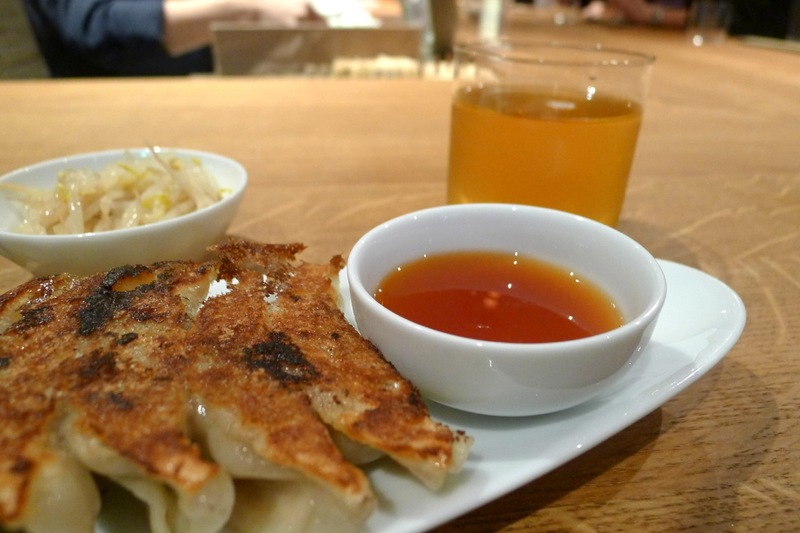 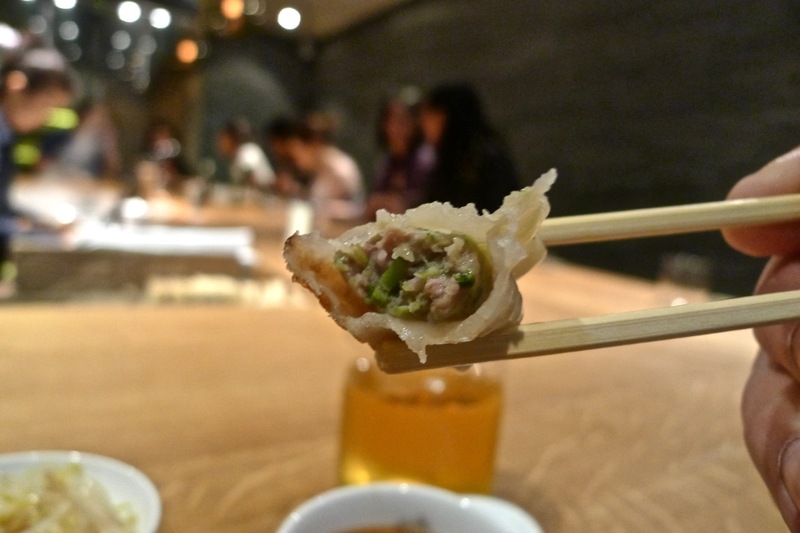 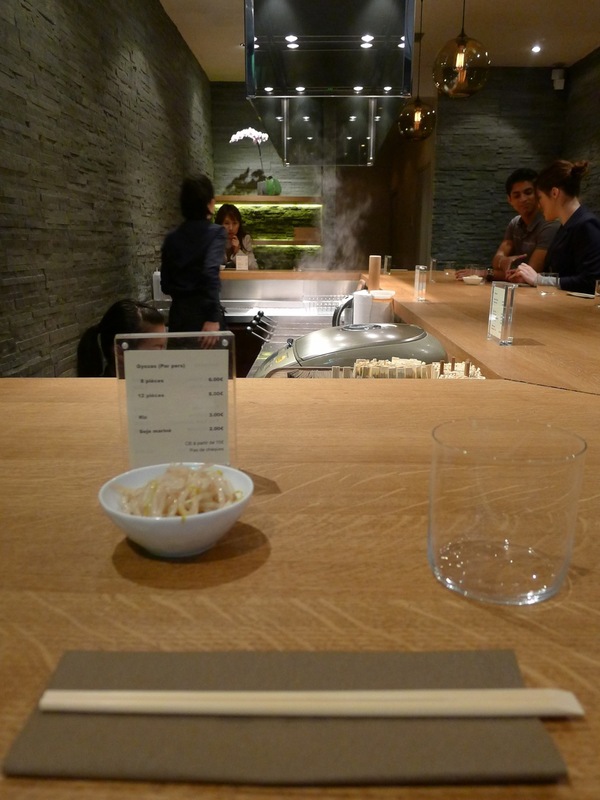 At Gyōza Bar the dumplings are prepared using the pan-fried method called ‘yaki-gyōza’. 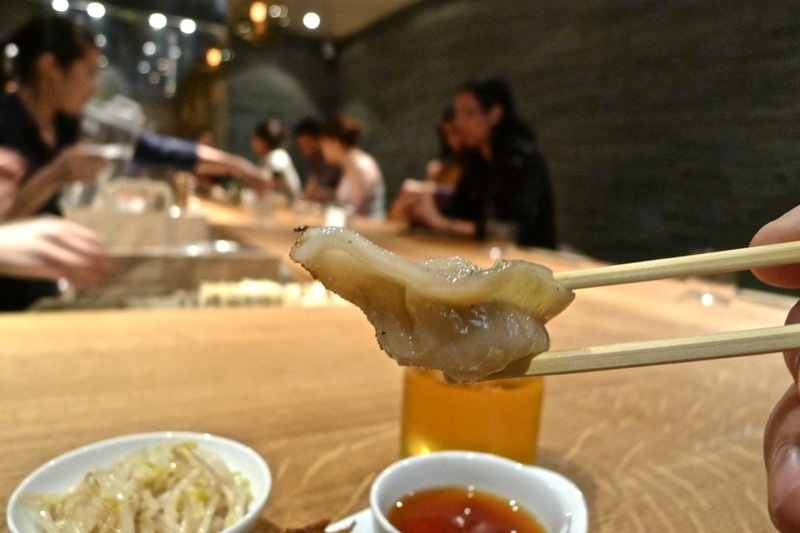 The ‘yaki-gyōza’ method involves them first being fried on one side, creating a crispy skin that adds flavour and texture. Water is then added and the pan lid sealed for the upper part of the gyōza to be steamed. 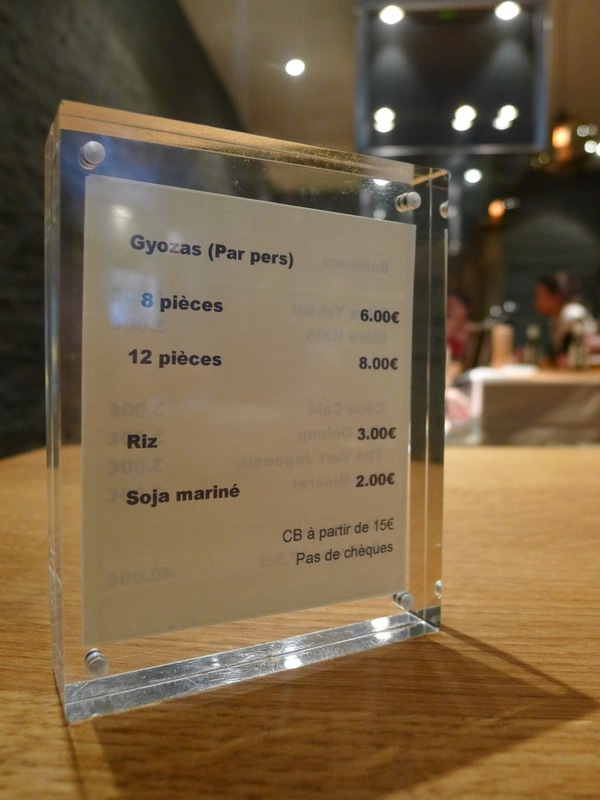 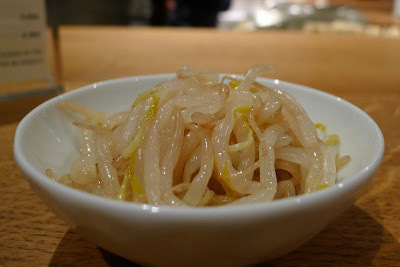 Also on the menu: a good quality sticky ‘riz’ (rice), sesame marinated bean sprouts and a simple drinks menu of just five options: Japanese ‘bière’ (Yebisu or Kirin), Coca Cola, Tea (oolong or green), water or, being France, Champagne Bollinger. 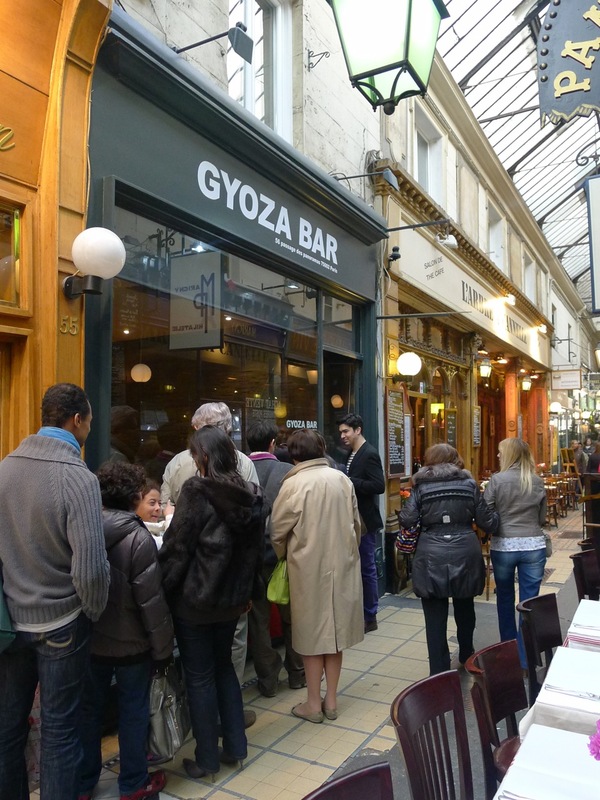 A fab little place – when in Paris, check out the covered walkways and wherever you plan to eat, save a little room and stop by in Passage des Panoramas for some of the best gyōzas you may ever get a chance to try – or if you are less greedy then me, I suppose you could just about make a meal of it? 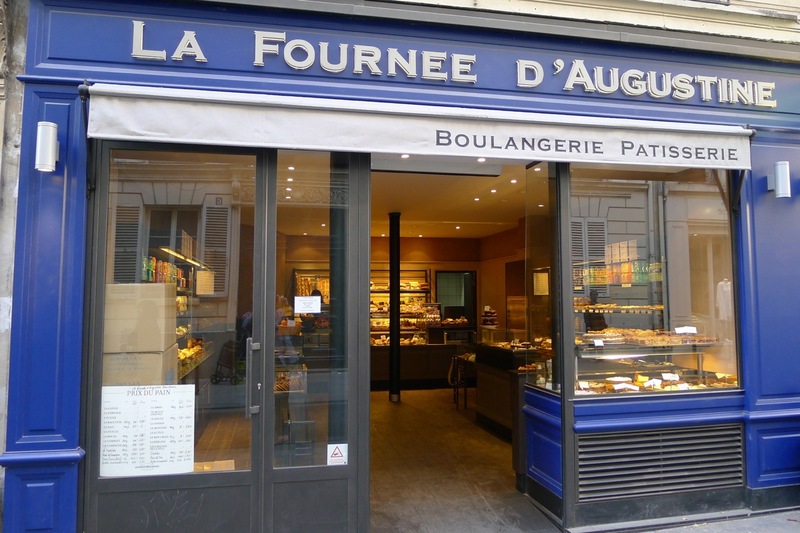 After my recent trip to Paris, I now believe one of them does exist and have even tracked it down to an address in the city… I even have photographic evidence! Now, before you get too exited, it’s not good ol’ Bob and don’t fear, it’s not the ‘WMD’. I think I may have discovered the mythical perfect macaron! The Citron & Guimauve Fraise Macarons from Ladurée - the perfect macarons? 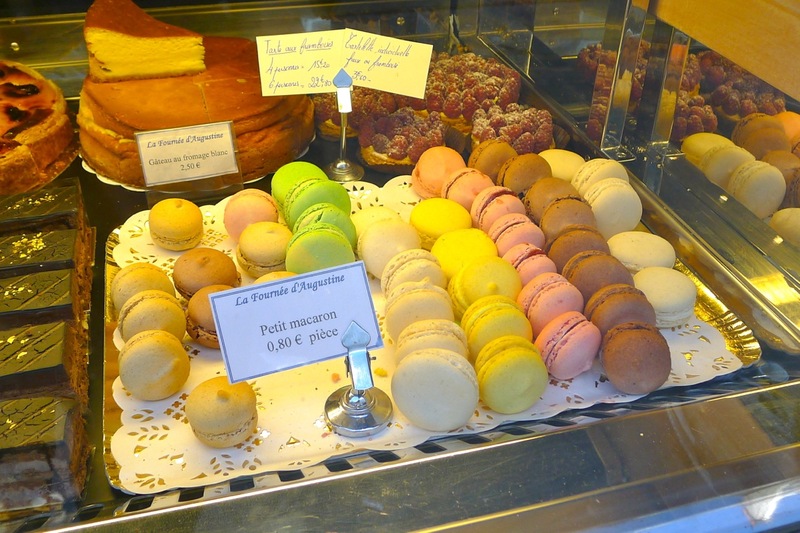 In English ‘macaroon’ can refer to both ‘French macarons’ (also called ‘Gerbet’ or ‘Paris Macarons”) and the more rustic ‘coconut macaroons’ (called ‘congolais’ in French. To avoid confusion, its quite common to use ‘macaron’ when talking about the sweet, crispy gooey centred colourful meringue sandwiches. The term has roots in the Italian word ‘ammaccare’ meaning crush or beat. 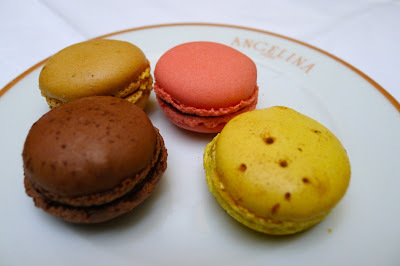 Macarons in Angelina - as good as Pierre Hermé and Laudrée? 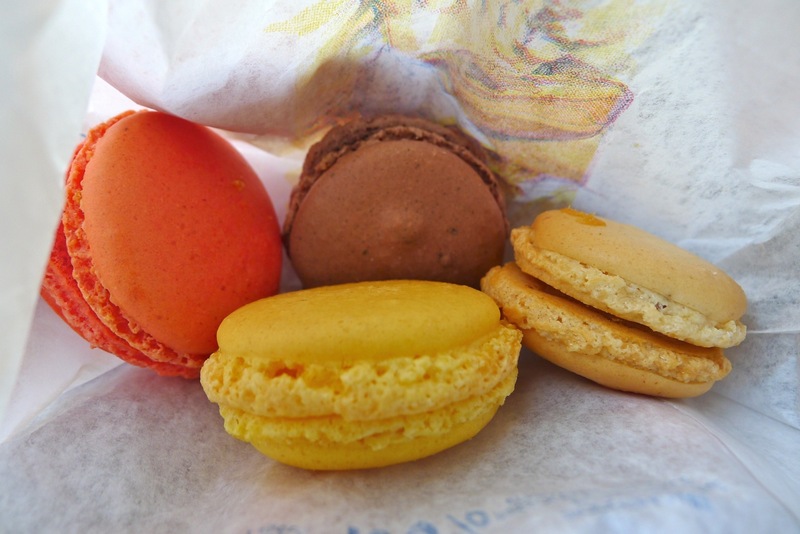 Larousse Gastronomique cites the macaron as being created in 1791 in a convent near Cormery but other sources say that they originally came from Italy and were brought to France by Catherine de’ Medici’s chefs who travelled with her upon her marriage to the French King Henry II. 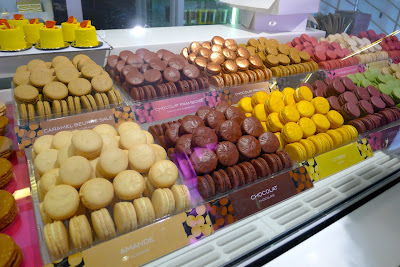 Some Pierre Hermé's fabulos flavours. 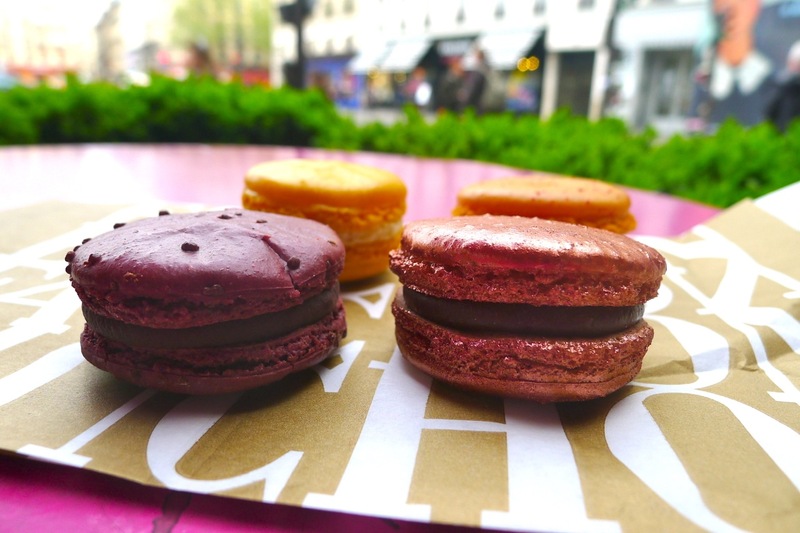 The double-decker macaron we recognise today was first created in the early 20th Century by Pierre Desfontaines of Ladurée, when he came up trumps with the idea of sticking two macaron shells either side of a delicious ganache filling. 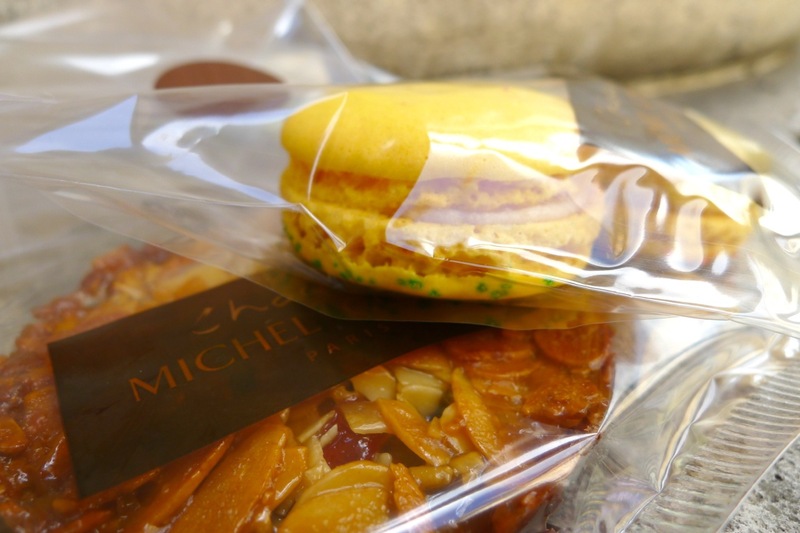 Ladurée are still one of the better known makers of macarons in the world; it is said that they sell fifteen thousand macarons every day! 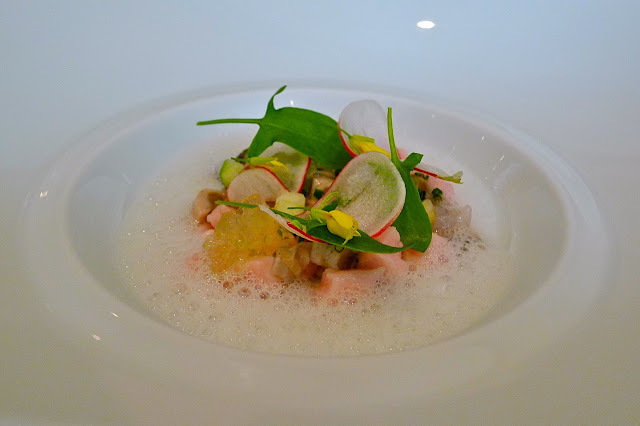 Michel Cluziel - good, but are they the best? During my recent trip to Paris I made it my mission to discover best macarons in Paris (and therefore the world?) 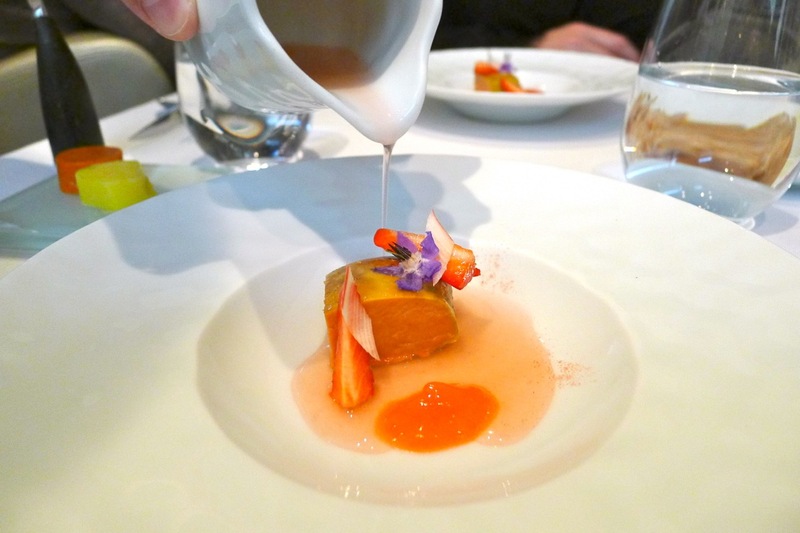 – with a dream of discovering perfection. Starting as I meant to go on, when we arrived at our hotel, Hôtel des Academies et des Arts (near the Jardin du Luxembourg and Montparnasse) I had arranged to be greeted with champagne and macarons by Pierre Hermé which we enjoyed in their adjoining Chez Charlotte ‘Le Palais des Thés’ tearoom. 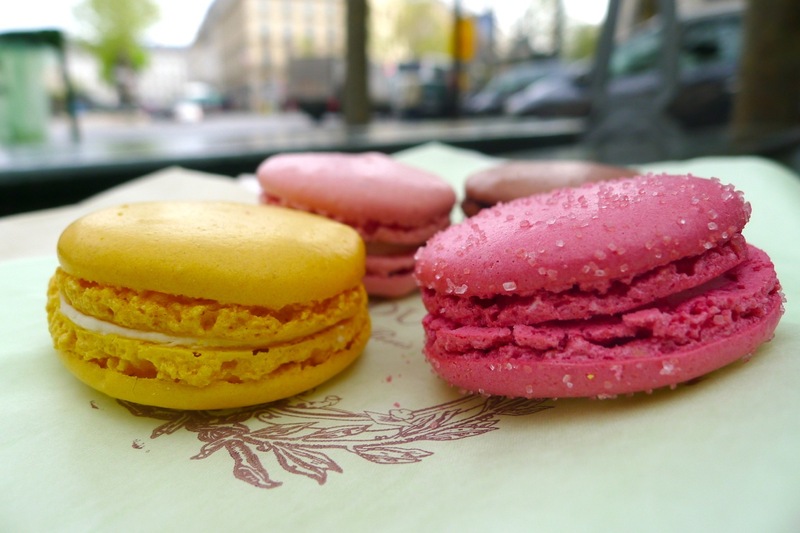 What makes the ‘perfect macaron’? Made principally from ground almonds, sugar and eggs whites (Pierre Hermé, master pâtissier insists that ‘old’ egg whites are better), what makes the ‘perfect macaron’ is obviously open to some debate. 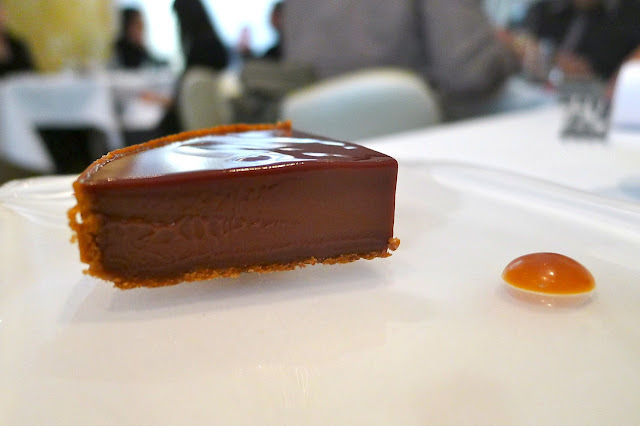 I look for: a plump dome shaped surface, with no cracks; a crisp texture to the bite (but not too dry, brittle or crumbly); a glossy finish, with no oil stains; a smooth finish (no imperfections, ridges, ripples or peaks); a well defined ‘pied’ or foot (pleat-like frills at the base of each meringue); a soft gooey filling; good colour and fantastic flavour. 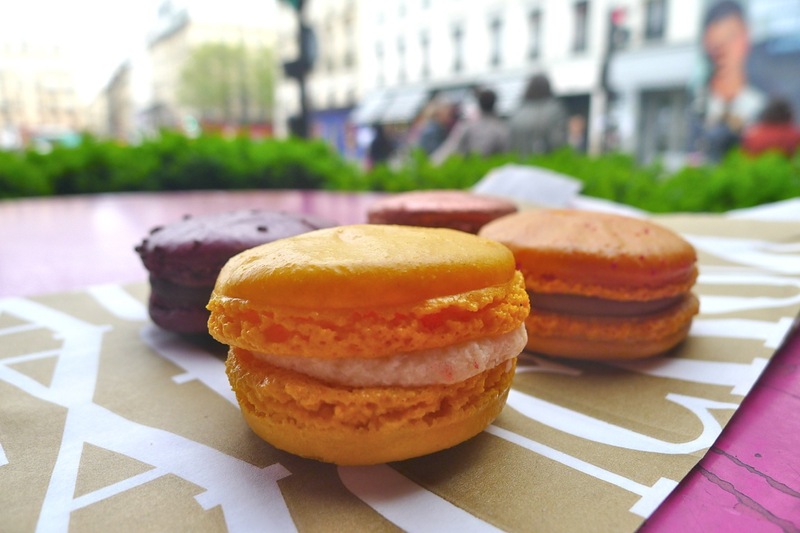 A Joni Mitchell fan, one of my wife’s missions in Paris was to catch a moment to enjoy a moment in the April sunshine ‘Sitting in a park in Paris, France’. 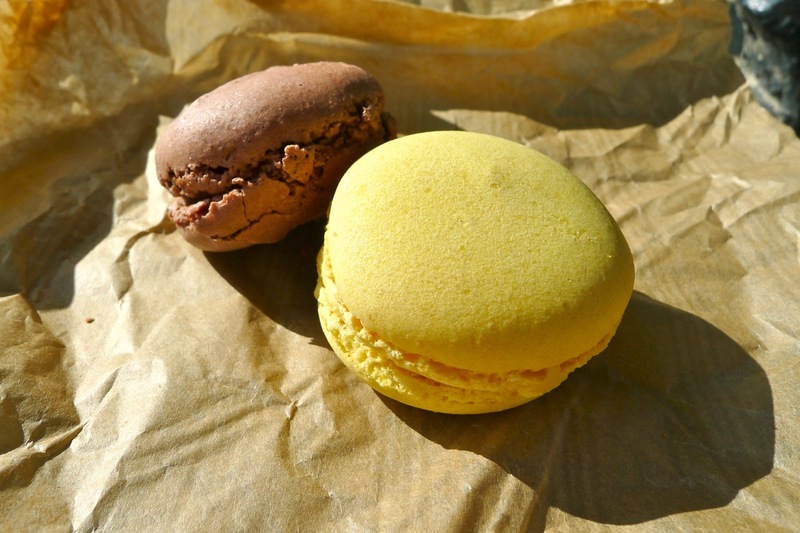 This gave me an opportunity to tear open the bag of meringuey delights and – appearance wise, the ‘pied’ or foot, especially on the chocolate one was not well formed and they lacked gloss. 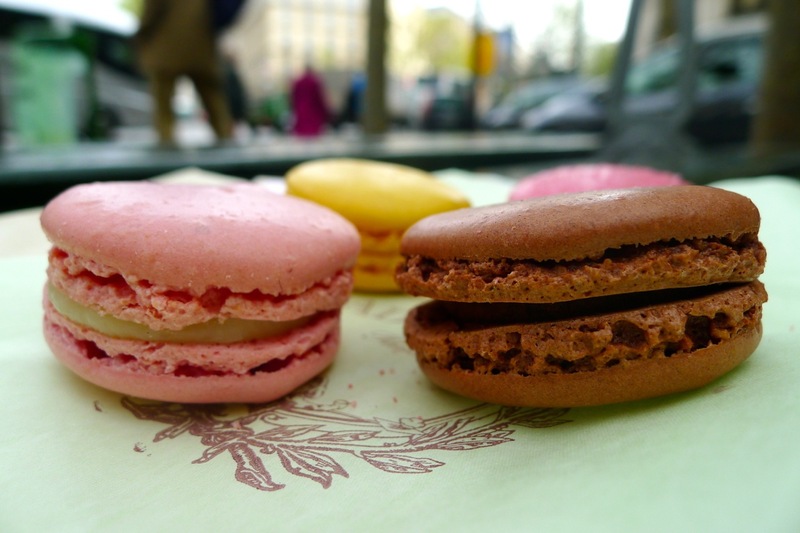 Texturally there not enough ‘goo’ in the centre and both flavours were not strong enough – for me, far from the best in Paris. 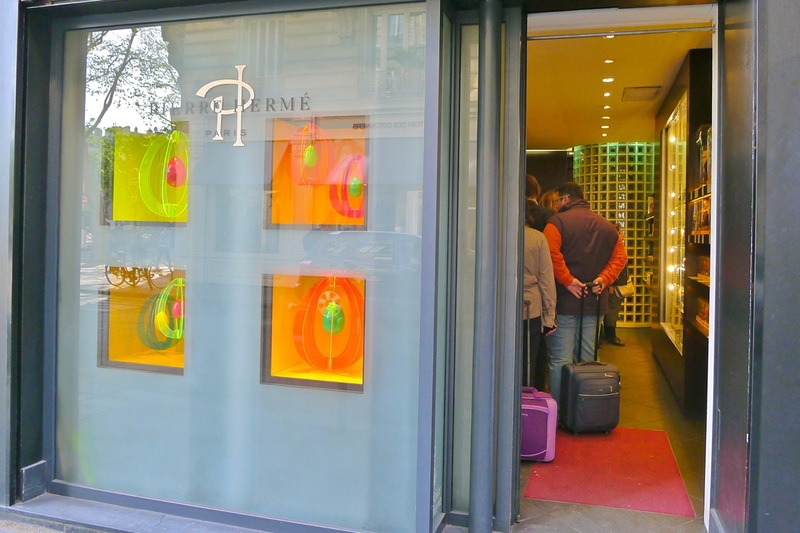 My next stop, Pierre Hermé has several outlets throughout the city (and indeed the world) but I visited the store at 72 rue Bonaparte. Famously they (and Ladurée) do not allow photography in their shops – a fact that I seemed to keep forgetting, until reminded. 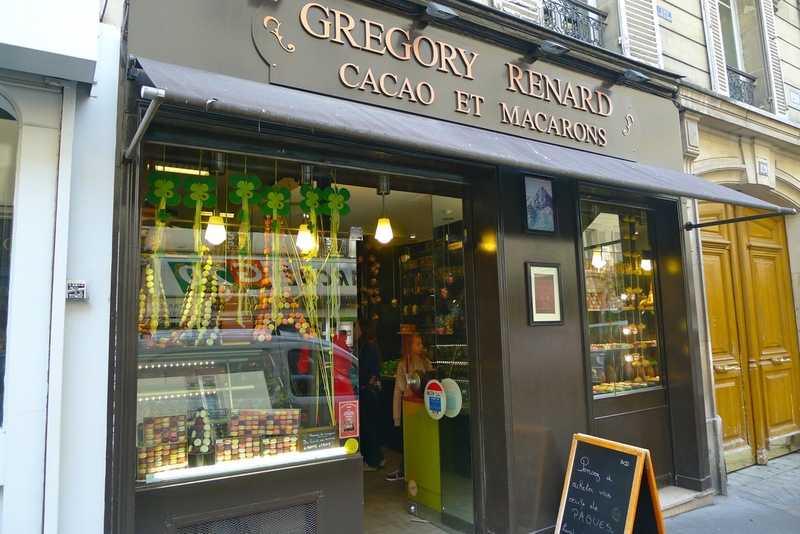 I selected: an ‘Éden’ (pêche, abricot and safran); a ‘Rose’ (Rose and Pétale de Rose); a two tone ‘Montebello’ (beautiful mountain - pistache et framboise); a ‘Chocolat Porcelana’ (pure origin Venezuelan dark chocolate) and ‘Infiniment Caramel’ (Salted-Butter Caramel). 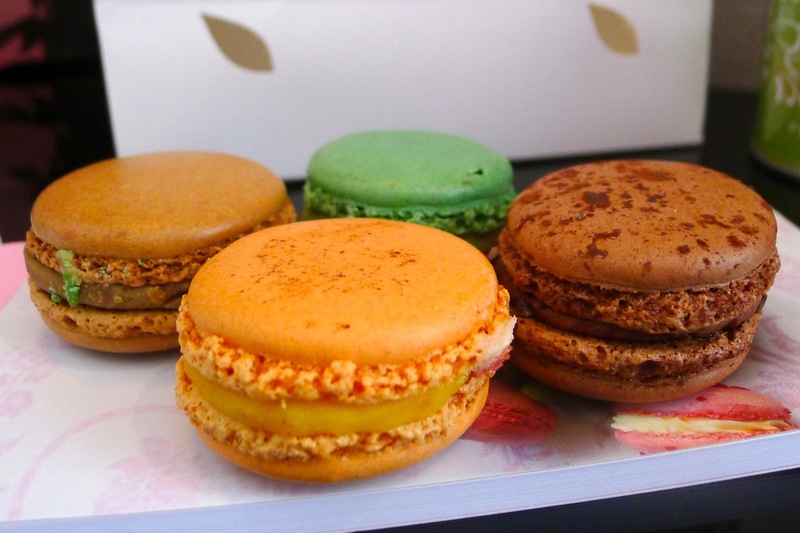 Pierre Hermé - the best macarons in Paris? 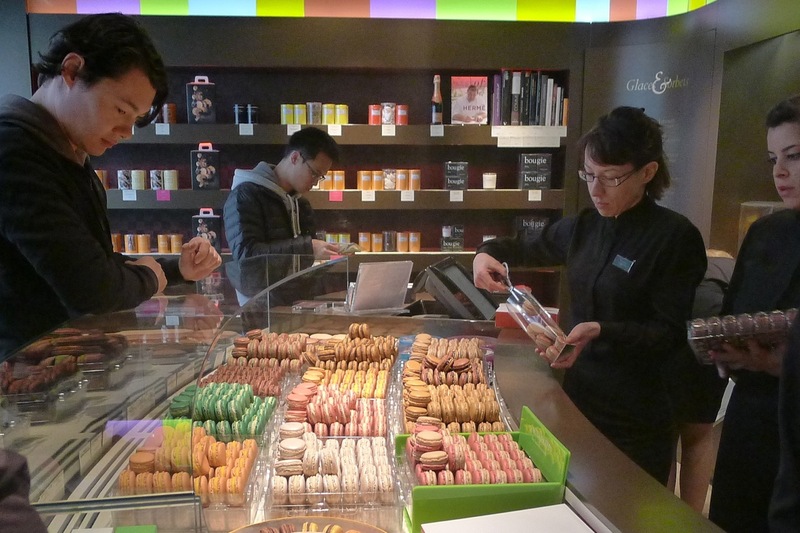 Mentally running through my checklist list for ‘what makes the perfect macaron’ it seemed as though the Pierre Hermé offerings were certainly getting close. 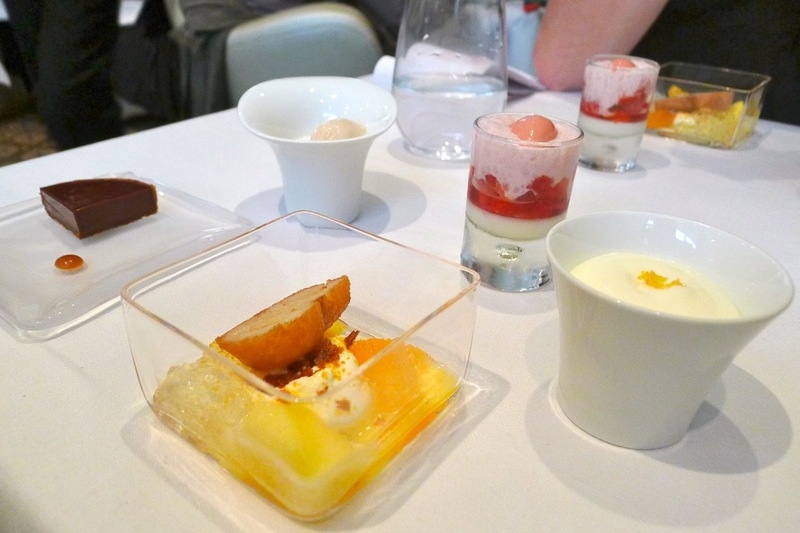 Everything I looked for and more (there were some wonderful sounding flavour combinations available but I selected fairly common ones to enable fairer comparisons with other retailers). 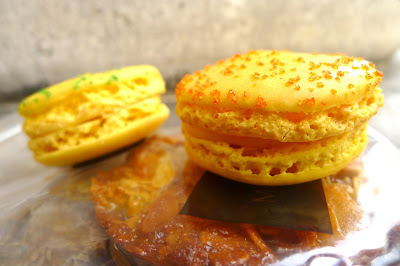 The chocolate and salted-butter caramel macarons tasted exceptional but for me, the peach, apricot and saffron combination was otherworldly – the delicious drupey pairing enhanced by the unique fragrant spice. 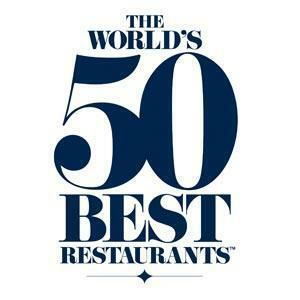 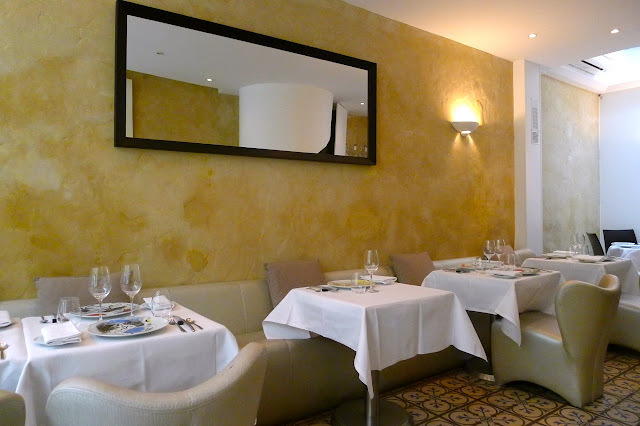 The best in Paris? 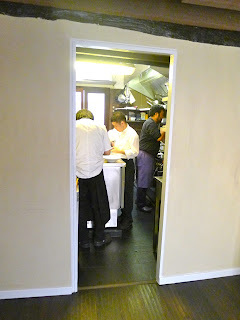 They could well be! 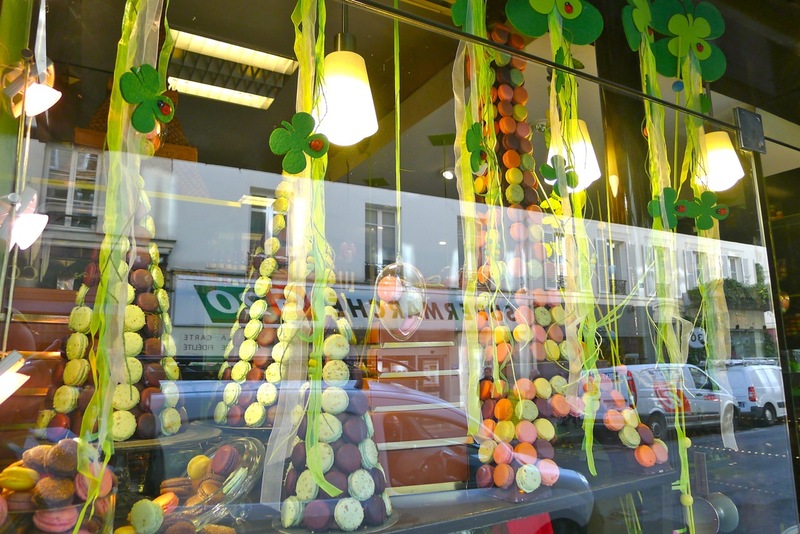 The next pâtisserie visited, with its Willy Wonka style window displays (including a four foot macaron and chocolate Eiffel Tower) was the one belonging to the famous Parisian chocolatier Grégory Renard (120 rue Saint Dominque.) I sampled a salted caramel, chocolate, lemon and raspberry macaron - for me the shells were a little too crisp and crumbly when compared to some others. 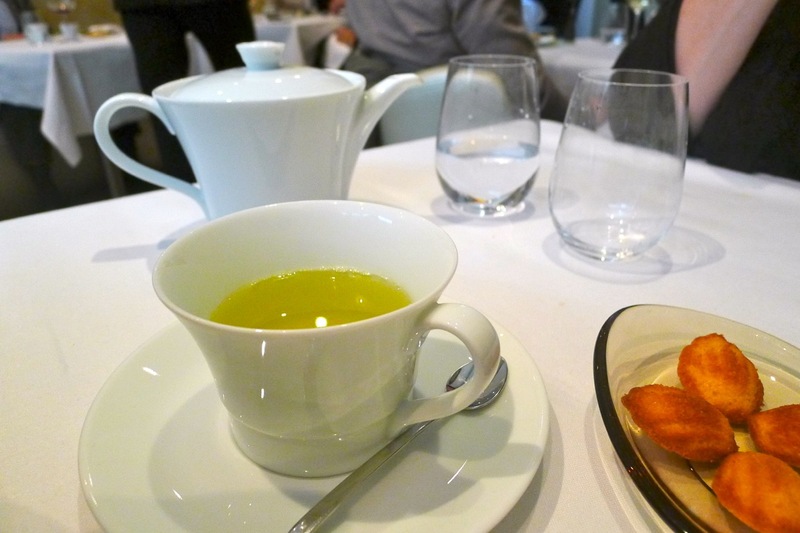 The lemon one however was great, with a real sharp citrusy tang – this aside, overall for me, definitely not the best in Paris. 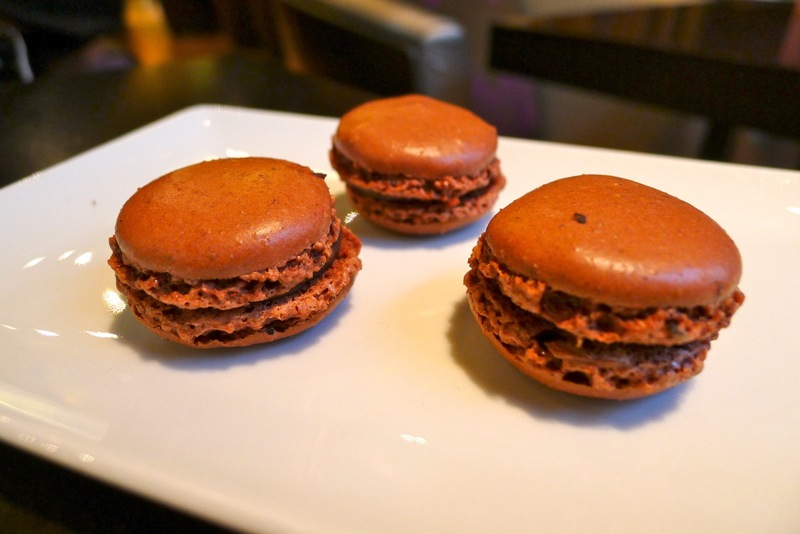 The next macarons sampled were the result of a happy accident. 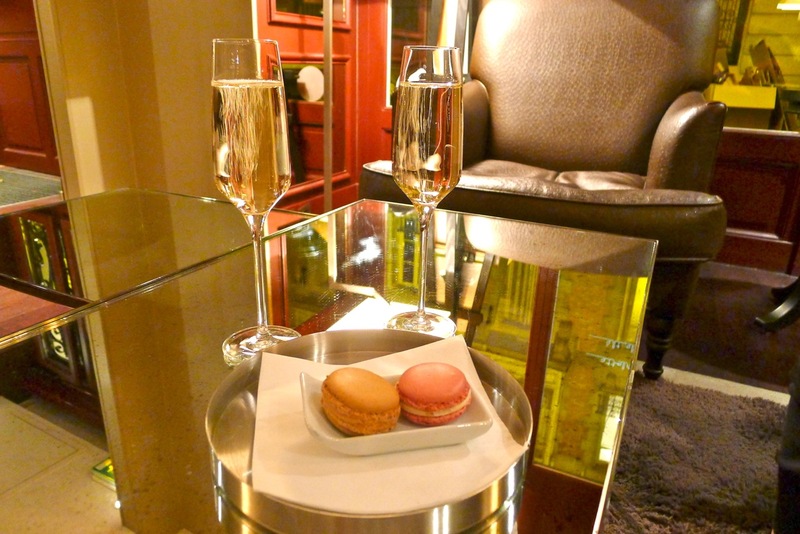 After being invited to the press opening of the Nespresso boutique in Manchester (see here) I was keen to check out their flagship store on the venue on the Avenue des Champs-Élysées – enjoying a coffee in their café I was pleased to see macarons on the menu and overjoyed when I saw that they were from Dalloyau. 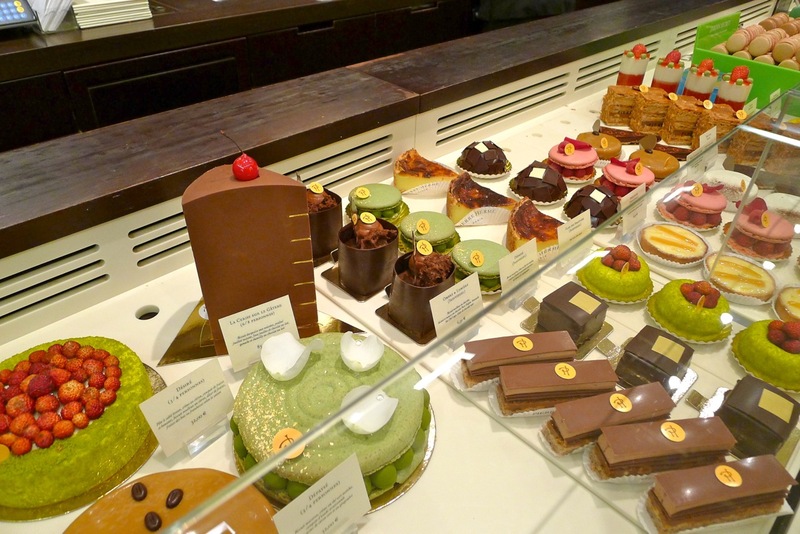 Dating back to 1682 (to put this into context: that’s 100 years or so before Napoléon Bonaparte was knocking about), pâtisserie Dalloyau are famed for inventing the indulgent ‘Gateau Opéra’ (Opera Cake) featuring multilayers of chocolate, ganache, coffee buttercream and coffee soaked almond sponge. 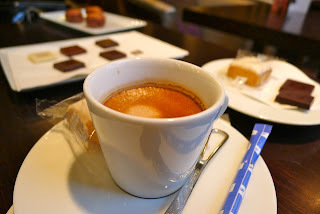 As such their chocolate macarons seemed the perfect accompaniment to my excellent Nespresso ‘Ristretto’ – as expected they had a wonderful rich chocolaty flavour; but for me did not reach the standard set by Pierre Hermé. The next stop on my macaron trail took me to Fauchon – a luxury gourmet store (at 24-26 place de la Madeleine) that has been selling such delicacies as foie gras, truffles, fine cheeses, confectionaries and cakes since 1886. 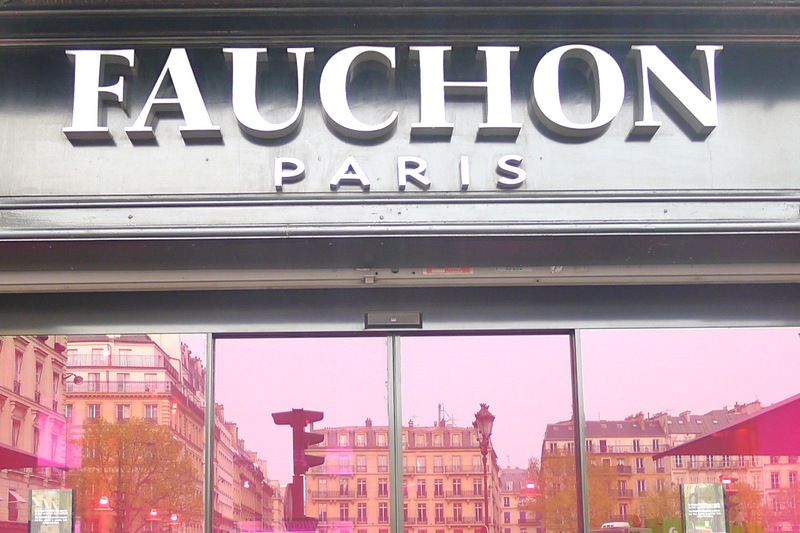 Fauchon is a fabulous store – any foodie visiting Paris should go and mooch about. 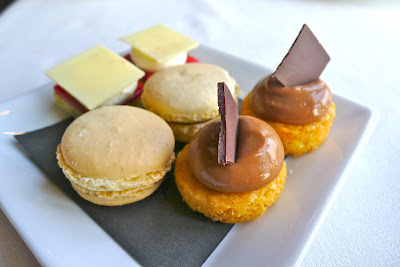 The ‘citron’ (lemon), ‘cassis’ (blackcurrant), ‘abricot’ (apricot) and bronzed Chocolate Praline macarons at Fauchon all had very good flavour but the meringues were not particularly smooth and the appearance of something as exquisite as a macaron is important – very good, but for me, not perfection and therefore not the best in Paris. 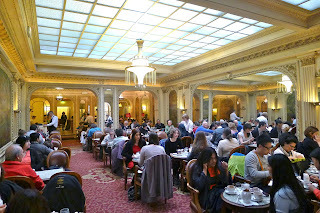 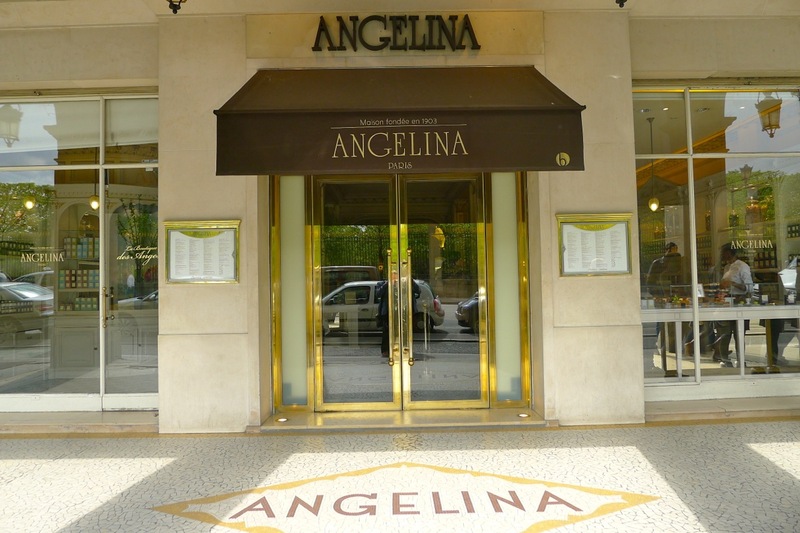 Certainly not the best and in fact the worst of our trip were the ones that I ate in Café Angelina’s tea room (226 rue de Rivoli) – an undeniably grand setting, once a popular haunt of Audrey Hepburn and Coco Chanel. 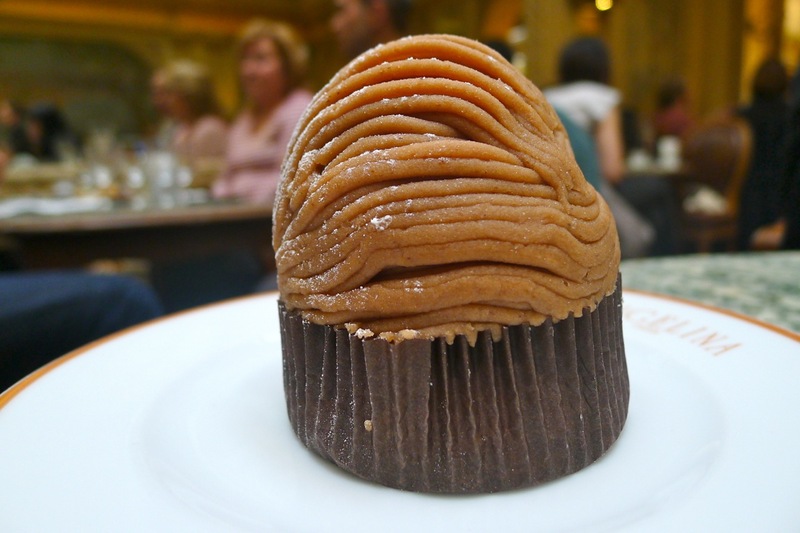 My wife selected the signature ‘Mont Blanc’ made from crème de marrons (chestnut cream) and whipped cream with a meringue base – it was ridiculously sweet and just tasted of claggy sugar paste. My macarons looked good; they were uniformly shaped, and had well defined ‘pieds’ but flavour wise they were bland and did not have the desired gooey centre. A real shame – the place seemed to be trading on reputation alone; the coffee was also the worst I had in Paris. 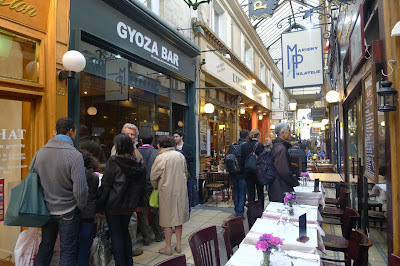 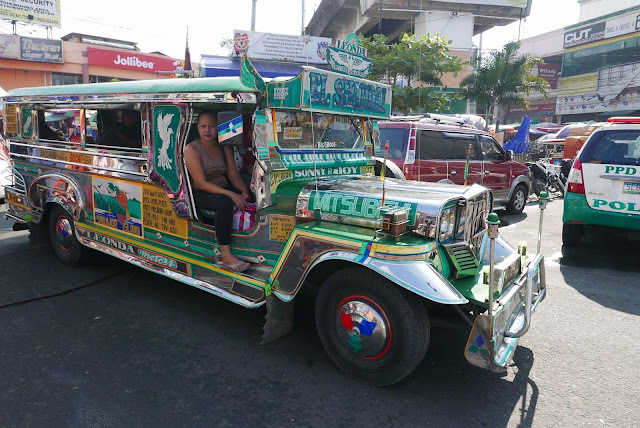 We quickly paid the overpriced bill, left what we hadn’t eaten (most of it) or drunk and left the place to the throngs of seemingly undiscerning tourists. 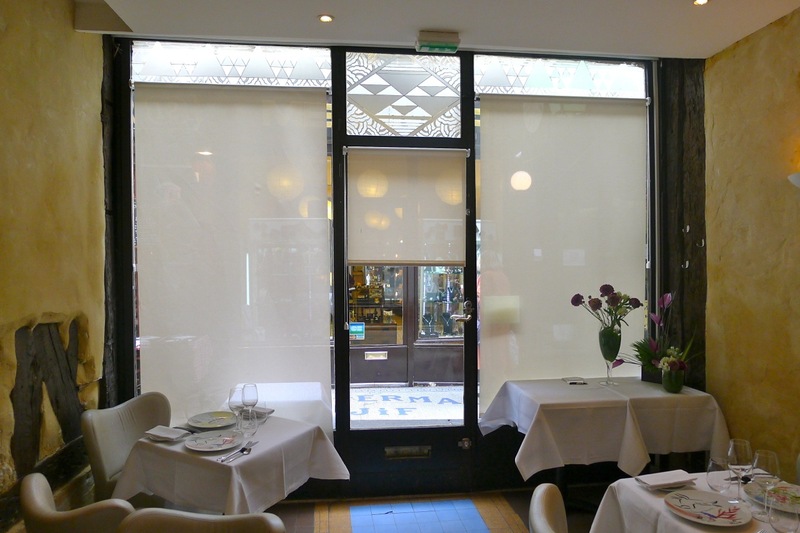 Sadly, I did not get round to visiting Jean-Paul Hévin (on 231 Rue Saint-Honoré) especially as I it later turned out I was unknowingly just a few doors away in Colette (on 213 Rue Saint-Honoré) and hear that their chocolate macarons are also very good. 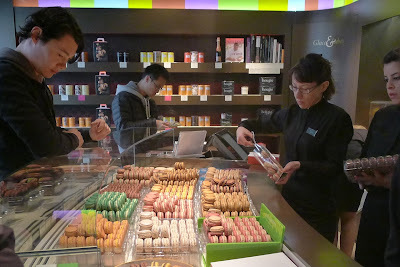 Not a pâtisserie but whilst in Paris I also sampled Alain Ducasse’s Michelin starred macarons in Le Jules Verne (see here) – naturally excellent but still not up to the standard set by Pierre Hermé. 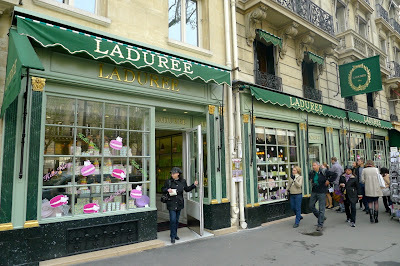 Ladurée - the original and still the best? Eventually I made my way to the venerable Ladurée (18 rue Royale & other locations). Alongside my ‘benchmark flavours’ of chocolat and citron I was tempted by a ‘Guimauve Fraise Bonbon’ (strawberry candy marshmallow) and ‘Fleur de Cerisier’ (cherry blossom). 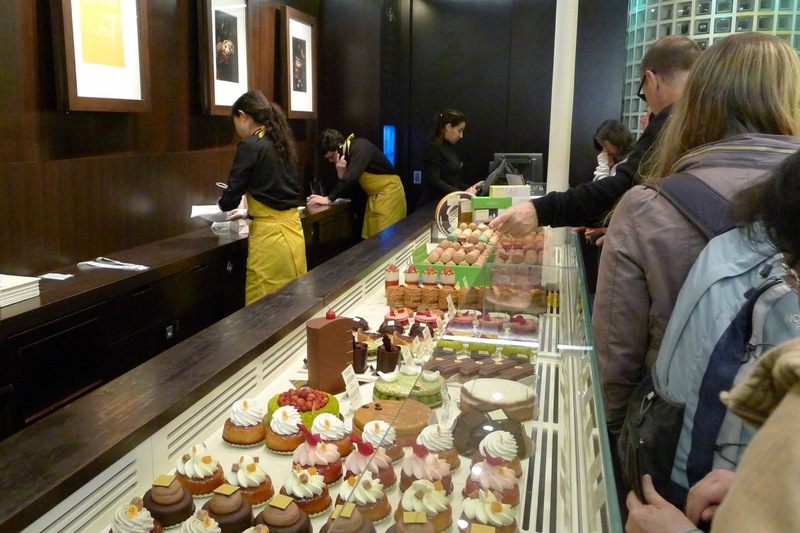 Appearance wise, the Ladurée offerings were spot on. 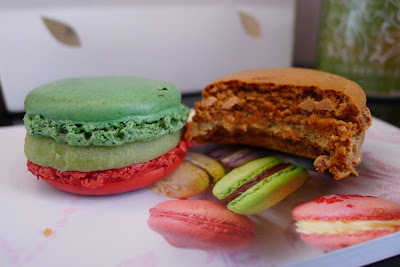 On to the all important taste test: I found the cherry one to be a bit floral for my taste and the marshmallow filling in the strawberry one, although tasty did not a macaron make. Ladurée macarons - the best in Paris according to Hungry Hoss. Hopefully the chocolate one would fare better. 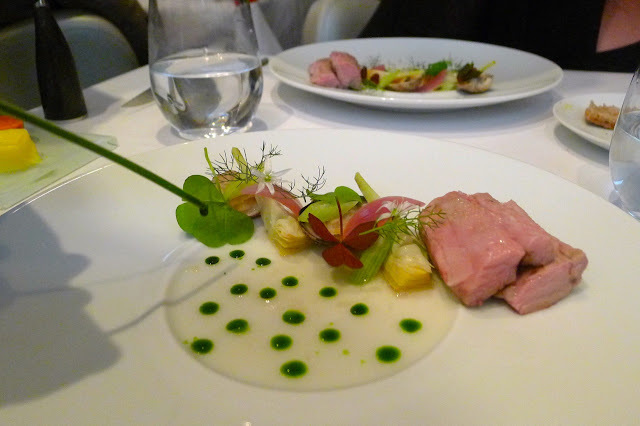 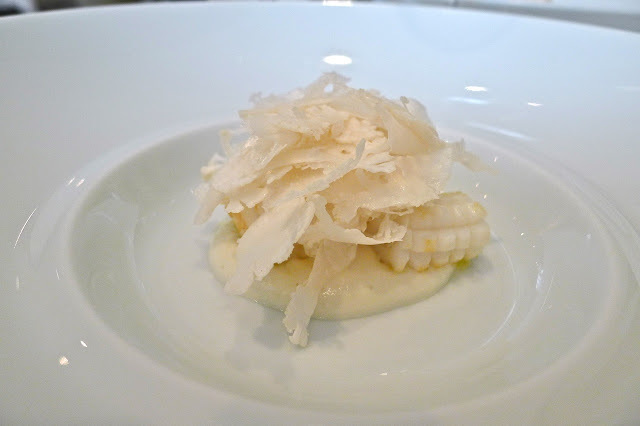 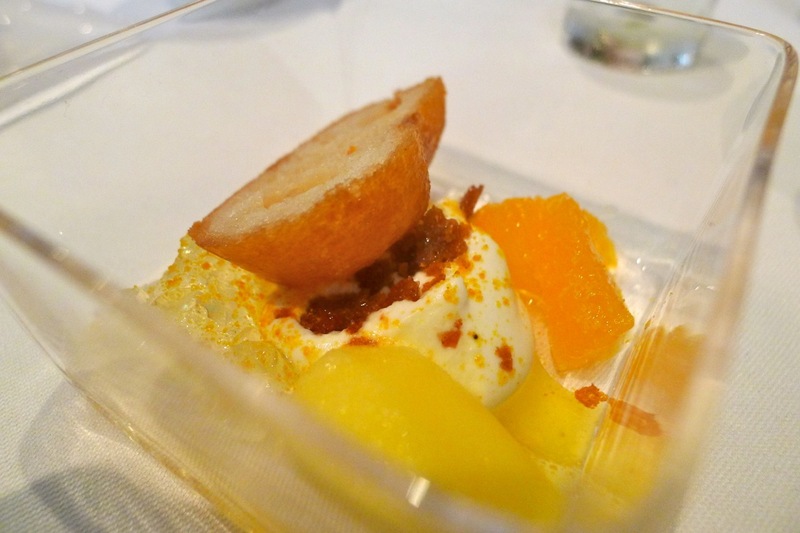 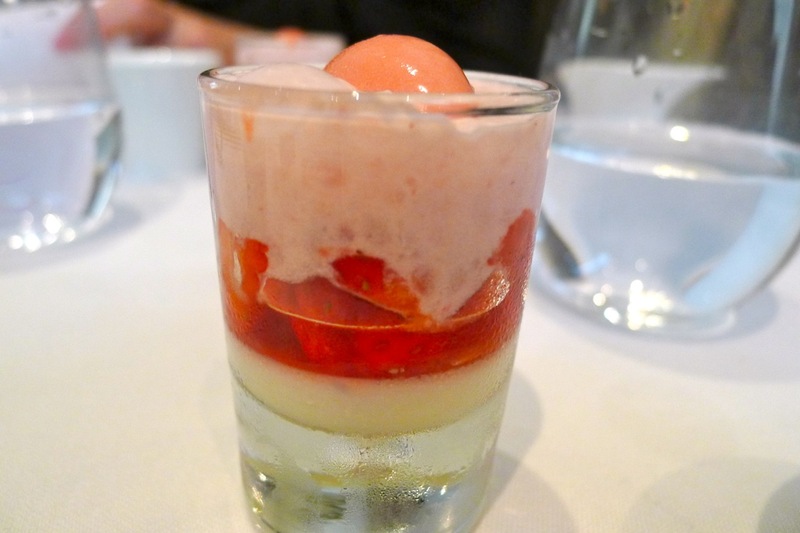 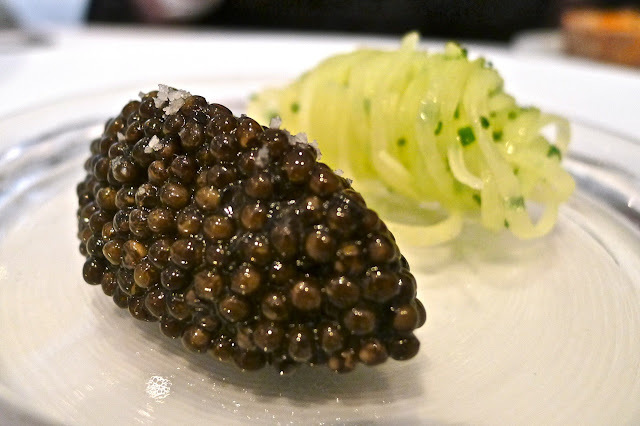 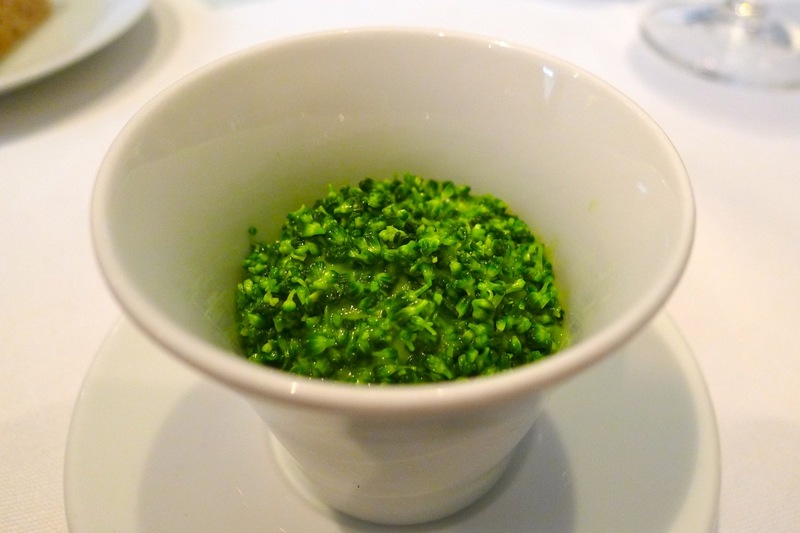 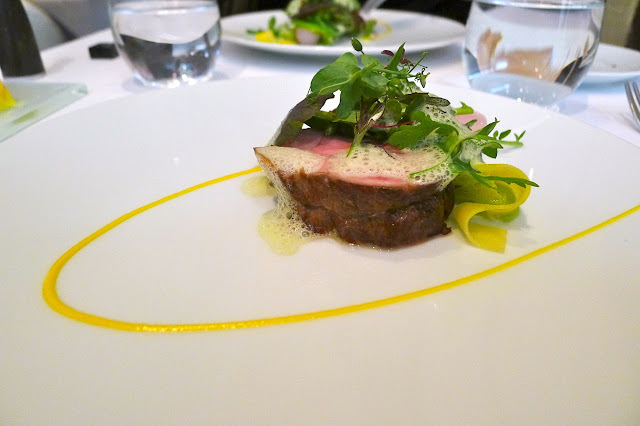 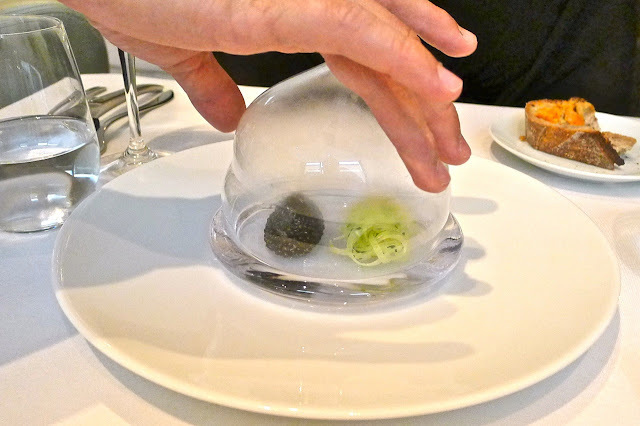 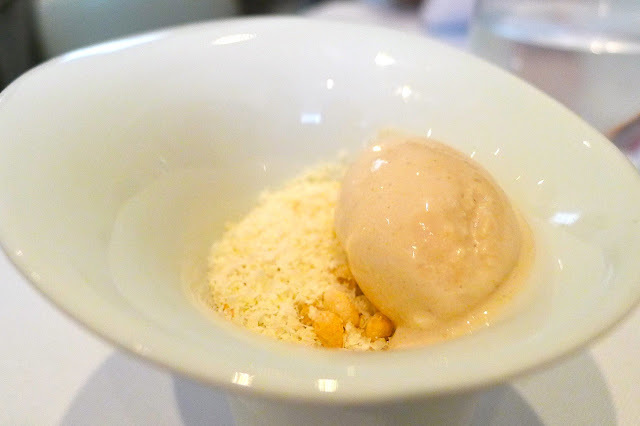 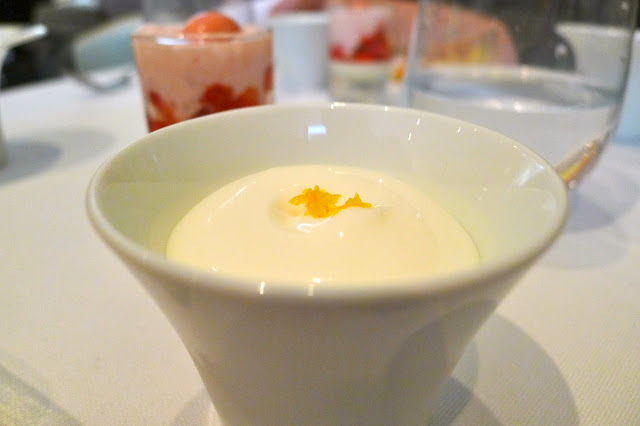 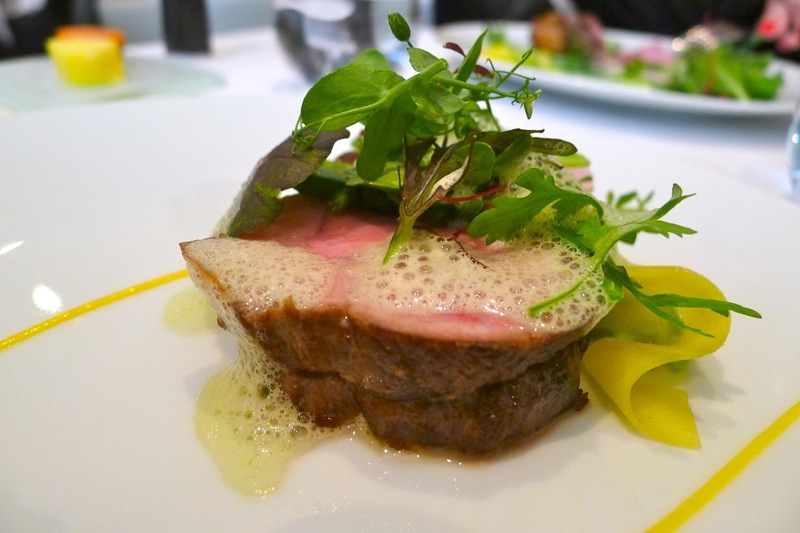 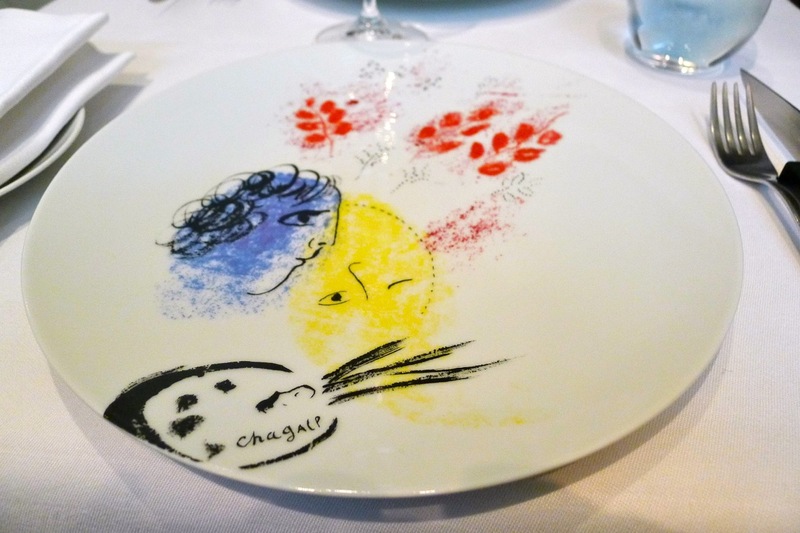 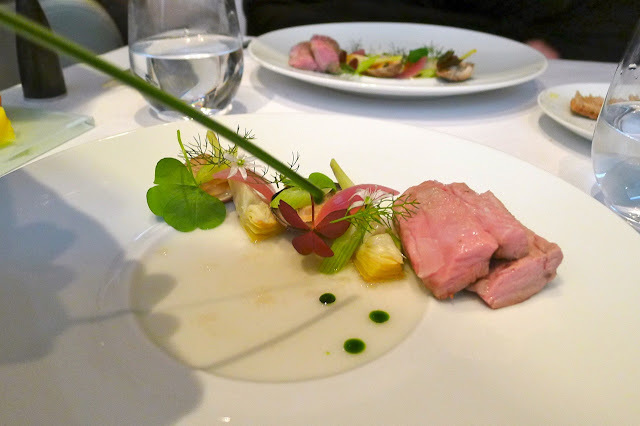 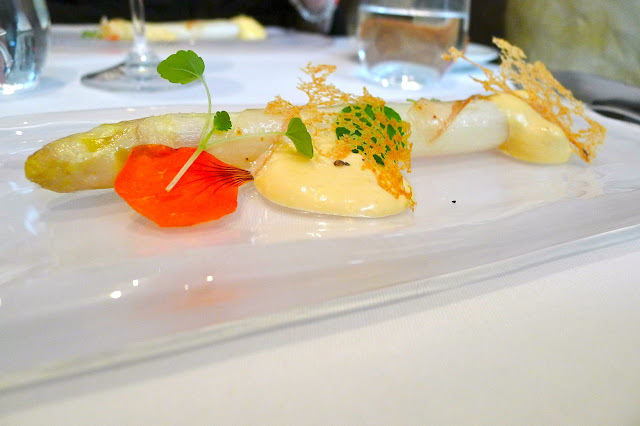 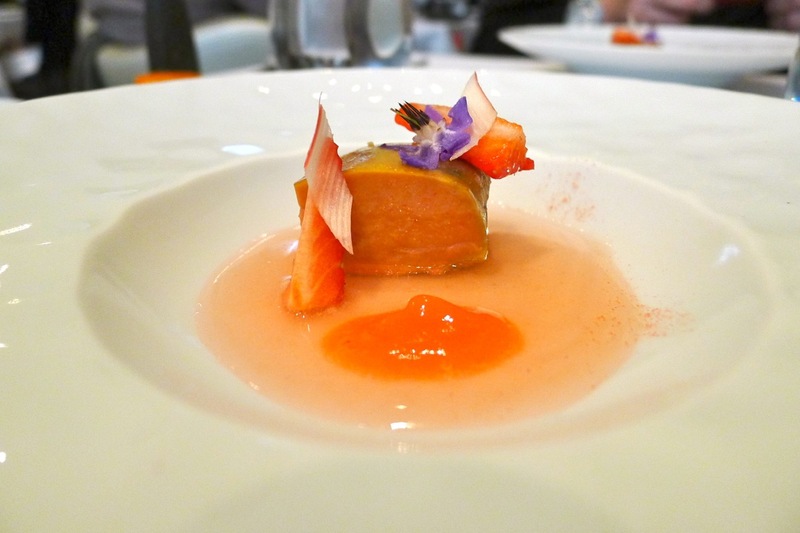 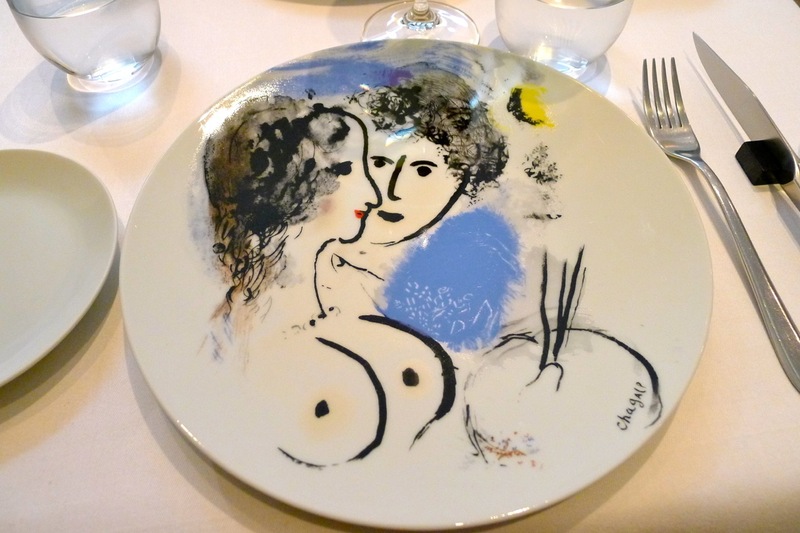 It certainly looked good – wonderful taste… could it be the best in Paris? 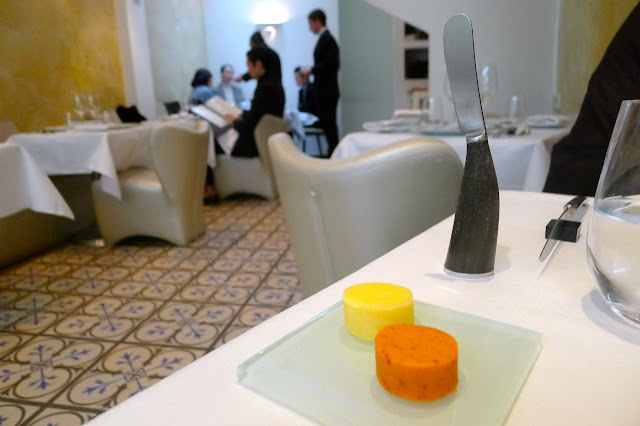 Just when I was contemplating having to go back to Pierre Hermé for a second opinion, I remembered that I still had the lemon one to go… you know that feeling when you slip on a pair of shoes for the first time and they feel just right? 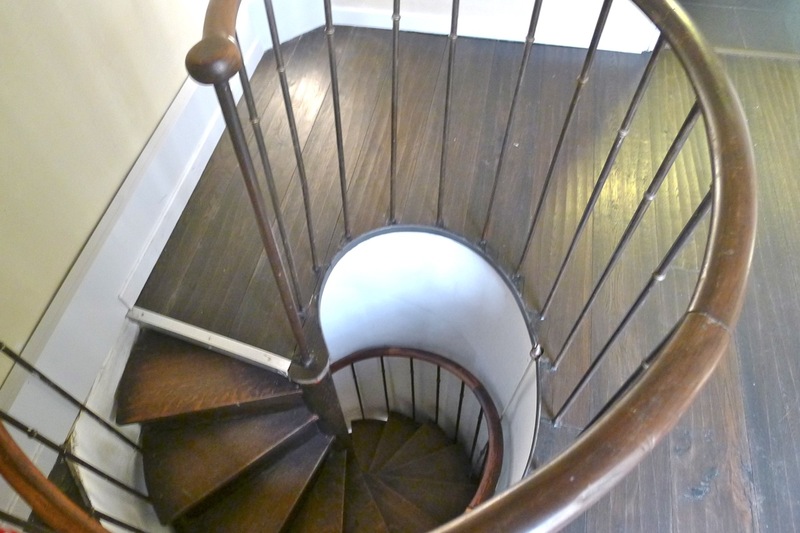 Or when you are house shopping and find a property that feels like home as soon as you cross the threshold? 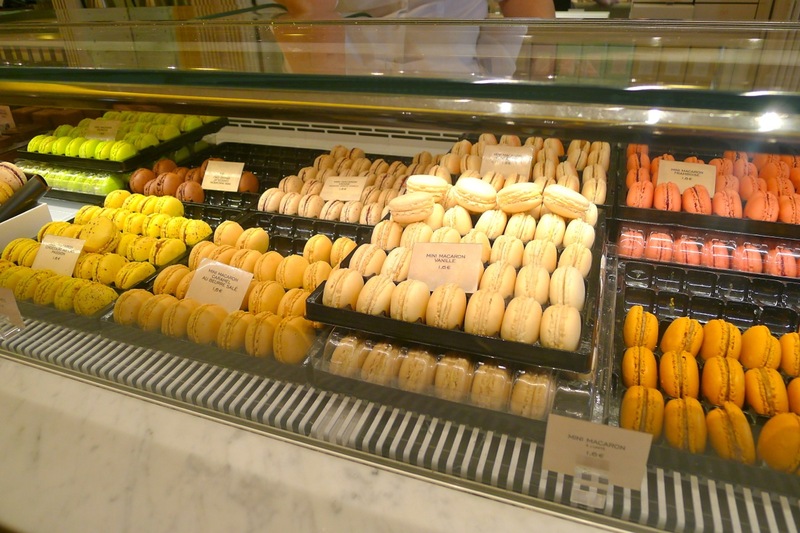 The moment I put the Ladurée lemon macaron in my mouth I knew I had found it… the perfect macaron. 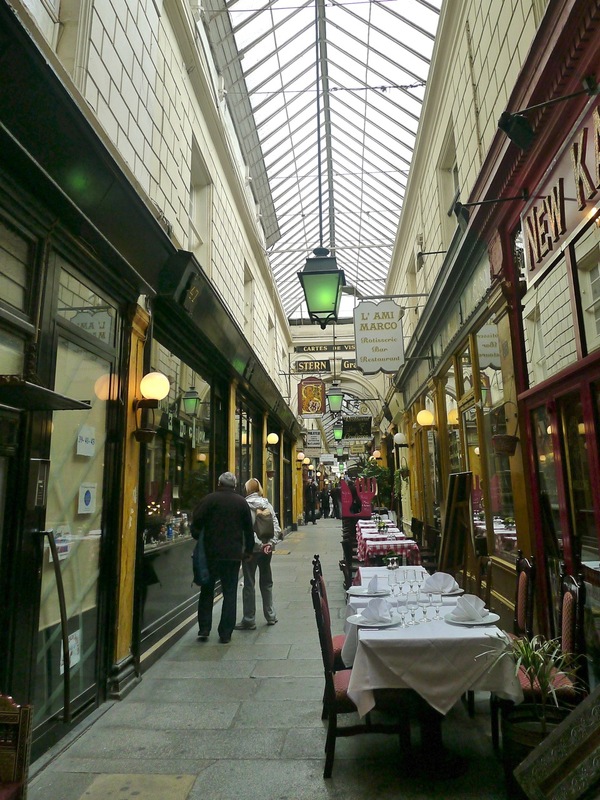 Well, at least in my humble opinion – only one way to know for sure: head to Paris and try for yourself.